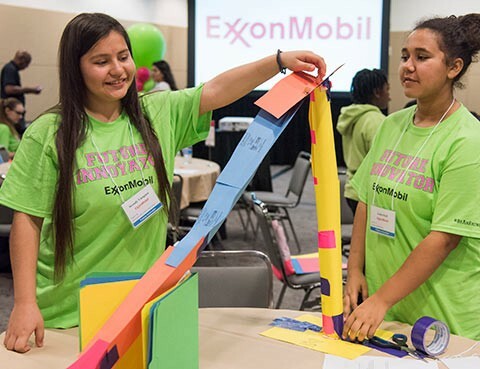 Students from Richardson West Junior High put their innovative thinking skills to the test as they built marble roller coasters and created marshmallow launchers during ExxonMobil’s annual Introduce a Girl to Engineering Day program this month at the Irving Convention Center. Introduce a Girl to Engineering Day helps focus a growing movement to inspire girls’ futures so they learn they have a place in engineering a better world. More than 50 DFW-area girls participated in interactive demos provided by presenters from The Perot Museum of Nature and Science and learned about various career paths within the engineering profession from video game designer to biomedical engineer. The event was one of many “Girl Day” programs taking place across the United States in conjunction with DiscoverE, an organization that helps unite, mobilize, and support the engineering and technology volunteer communities. DiscoverE’s mission is to sustain and grow a dynamic engineering profession through outreach, education, celebration, and volunteerism.